Rashidi Yekini remains a cult-hero in Nigeria four years after he passed on. Yeking, as many of his admirers call him, still holds the record of being his country’s all-time top scorer in men’s internationals. With 37 goals in 58 international appearances for Nigeria at senior level, the legend of Yekini remains a never-ending story. Of course, Yekini’s story of an apprentice mechanic becoming a football superstar was well-etched despite being a late-bloomer in the beautiful game. Former teammate, Sunday Oliseh, eulogised Yekini as “one of Africa’s best” when the news broke of his sudden death four years ago. “Rashidi Yekini is definitely one of the best African players and legends to ever walk this earth. Rashidi was full of pace, had a superb shot, could jump very high, was calm in front of goal and was a very loveable person once you got to know and understand him. We lost not only a brother, friend, human being, legend and compatriot, but we also lost a great opportunity to find out his unique secret of how to score goals easily like he did which only he knew how to,” Oliseh wrote on his blog. World soccer governing body, Fifa, created a post on its official website titled: ‘Remembering Yekini.” It took time to describe the iconic image of the 1994 World Cup in the USA as “memorable.” Yekini became the first Nigerian to score at the Fifa World Cup and at the age of 30. “FIFA.com looks back on his memorable goal and subsequent celebration. 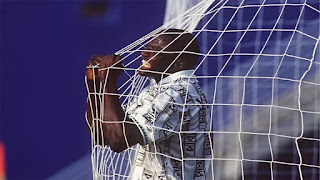 Yekini who played for several clubs in Spain, Greece, Portugal and Switzerland, could hardly believe he had scored and spontaneously grabbed the net, shaking it in celebration. “The photo of the 58-time Nigeria international captivated the world and even today the former striker, who in 1993 was the first Nigerian to be voted African Footballer of the Year, remains a respected figure in the global football family,” Fifa stated on its official website yesterday. Yekini just did not leave his footprint on the biggest stage in world football, he returned to his country where he had started his professional career to make one final bow in the game. He joined Julius Berger in 2003 at the age of 39 and his presence attracted fans back to league venues in Nigeria. Yekini capped that season with one of the finest performances when he scored a hat-trick against Kwara United at the MKO Abiola Stadium in Abeokuta on March 1 that year. Yekini simply rolled back the years in that Nigeria top-flight game in the rocky city of Abeokuta 11 years ago. For a 39-year-old man, he scored a penalty to draw Julius Berger level and then produced two sublime moments – netting with a bicycle kick and a flying header – to help his side to a 3-1 win. Yekini till date still holds the record as the oldest hat-trick scorer in the Nigerian top division at 39. Respected journalist, Kayode Tijani, told supersport.com that the stories surrounding Yekini’s passing away remain a sad tale. “On a day like this we are supposed to rejoice but the circumstance surrounding his death is absurd. No apology. He was killed. Yekini got too much attention in his life because of who he was. After his career he just wanted to be alone, and I see no crime in that. They said Yekini was mad. As mad as they claim he was, he would drive himself to training everyday and back to his house (in Ibadan). “Yekini, at that time when stories were being bandied about of him being mad, was doing a lot of charity work unannounced. Dimeji Lawal (a former Nigeria youth international) told me that Yekini gave some boys N100, 000 while training. I won’t even name a former Nigeria international who had a hard time and Yekini went to him to assist him and he (Yekini) promised him that no one will know of the assistance he rendered to him,” said Tijani, who is versed in documenting videos of past sporting events about Nigeria. Garba Lawal, a teammate of Yekini at the 1998 Fifa World Cup, stated that Nigeria’s all-time leading scorer was a “quiet person.” He added that Yekini was a thorough professional in the game. “He was a very quiet person but he could crack jokes a lot among the players. After that, he would return to his quiet self. But Yekini was a very, very good person and a professional to the core. It will be hard to forget such a man who stood out,” Lawal told supersport.com.